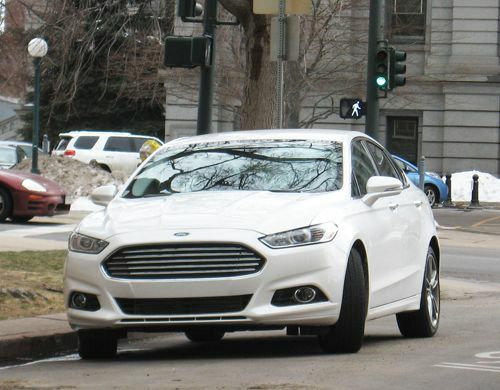 Ford brought a bright shiny sample of their 2013 Ford Fusion Titanium to Denver last Friday, allowing members of the Rocky Mountain Automotive Press an opportunity to test it out for an hour. Driving around the city traffic for most of the hour, we found the Titanium model, the top of the line, to be fairly comfortable, phone friendly and a very adequate choice for city driving at a price around $35K. It featured a 2.0-liter inline four-cylinder GTDI engine that produced a very distinct audio signature for a small engine. Ford has obviously spent a lot of time tuning the engine to have a aesthetically pleasing sound when accelerating and that was one of he first things that stood out during the test drive. Unfortunately, an hour is not a lot of time to spend in a vehicle for a thorough evaluation, but we liked the leather trimmed seats and steering wheel, the way it handled and presumably the mileage achieved by the four-cylinder engine, though it is not yet rated and we didn’t put enough miles on to get any significant reading. Upon walking Paul Witt and Heidi Swartzloff, local publicity folks for the brand, out to show them where the Fusion was parked, we walked by the 2013 Lexus GS 350 I’d driven to the event. The Ford representatives then asked somewhat facetiously, yet with some sincerity, how the Fusion Titanium compared to the Lexus. After considering the question for a while, there are a few distinct differences, as one would expect, but perhaps less than the price gap would imply. The major differences are pretty easy to articulate. First the Lexus is nearly twice the price of the Ford at $60K. Part of what makes a luxury car is insulation from the outside world and the Fusion certainly allows a bit more street noise into the cabin. In the Lexus you feel like a king – like someone upstairs likes you – like you must have been doing something right – in short, driving a Lexus GS 350 feels very good. Driving the Ford Fusion Titanium doesn’t feel quite like that, but it will make you feel like a smart consumer with a vehicle to take pride in and most likely money left over for other things. Obviously the Lexus GS 350 has a much more powerful engine with a delightful sound all its own, but the Fusion has a remarkably pleasing sound for a little four-cylinder and accelerates smartly, though it couldn’t keep up in a street race with the Lexus. Further, the Lexus is at the sharp edge of technology, with so many high-end features it will be hard to learn and appreciate half of them in the space of a week. Then again, the Fusion has 18-inch aluminum wheels, a blind spot alert, fog lights and a rear spoiler, much like the Lexus. The Ford has power adjustable leather seats, too, and a very nice stereo setup, but not the power bolsters or the Mark Levinson 17-speaker, 535-watt concert surround sound system found in the Lexus. In terms of style, the Lexus looks as good as a 5-Series BMW, with crisp lines and a staunch bearing. The Ford’s new grille seems to hint at a slightly exotic sports machine – not quite as impressive as the Lexus, but with character that stands proud on its own. So is the Lexus GS 350 worth $25K more than the Ford Fusion Titanium? We suspect that has a lot to do with what you can afford and what you place value on. It would be easy to get quite used to driving the Lexus, but it wouldn’t be too difficult to live with the Ford Fusion Titanium either. Certainly with the Ford it would be a lot easier to pay the installments, fuel up and insure. Those things make a big difference in the lives of some folks.